With so many options available, it becomes somewhat of a difficult feat to discern which furniture you should buy and how you get around to actually choosing it. As promised, we are providing you with further tips to keep in mind when shopping around for outdoor furniture. Invest in some time to properly check out the quality of the pieces you are considering. Our climate calls for high quality materials outdoors, perhaps even more so than indoors. Not only should you look out for the design and build of the products, but also that the materials used offer long-term durability and are easy to care for and maintain. Remember that cushions make hard outdoor furniture comfortable and more visually pleasing. There are many fabrics that can add appeal, colour and design to your outdoor space, but choose wisely. Typically, the best outdoor fabrics are made from solution-dyed acrylic or textylene which, apart from having protection against colour fading, mould resistance, flame retardance, and water repellance, also offer skin protection by blocking up to 97% of harmful UV rays..For comfort and style, add some throw pillows with colours and patterns that match the fabrics you choose for your furniture cushions. 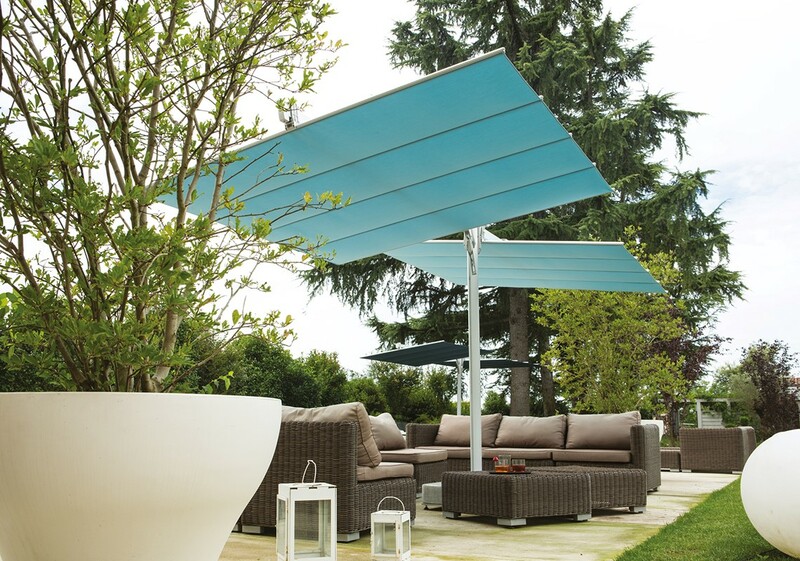 Shading is of utmost importance when dining or lounging outdoors. A made to measure timber structure is the perfect solution to shade a dining area, or how about considering a large day bed for the ultimate lounging area? If you need umbrellas, opt for freestanding, cantilevered models, and if you need to cover a very large area, you could also opt for double shading systems. Be sure to choose umbrellas with wind vents, a sturdy frame and a solid base for safety. A nice floor outdoors goes a long way in creating an elegant, but also safe and comfortable ambience. 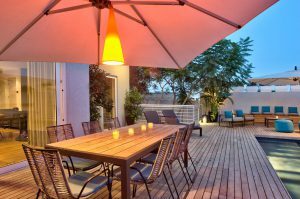 Decking instantly adds warmth and luxury to an outdoor area and with the choice available nowadays, one can be sure to choose the type that is right for the space available, and maintenance that is required. Composite decking requires minimal maintenance whilst real timber decking such as teak or IPE requires more regular maintenance. 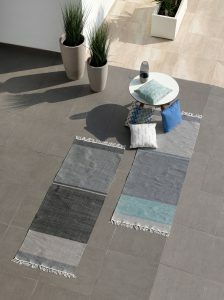 Rugs can also add the final flourish to your outdoor living space. Choose one that is made to be outdoors and can be periodically hosed off or easily swept. Pick a rug that balances the style and colour of your new furniture and completes your design. To ensure that your outdoor furniture and accessories will look good for years to come, ideally it is stored indoors during the winter months. Some outdoor furniture also comes with storage covers that allows it to remain outdoors if one does not have space indoors. During the warmer months, make sure you clean your furniture intermittently and maintain it as appropriate. 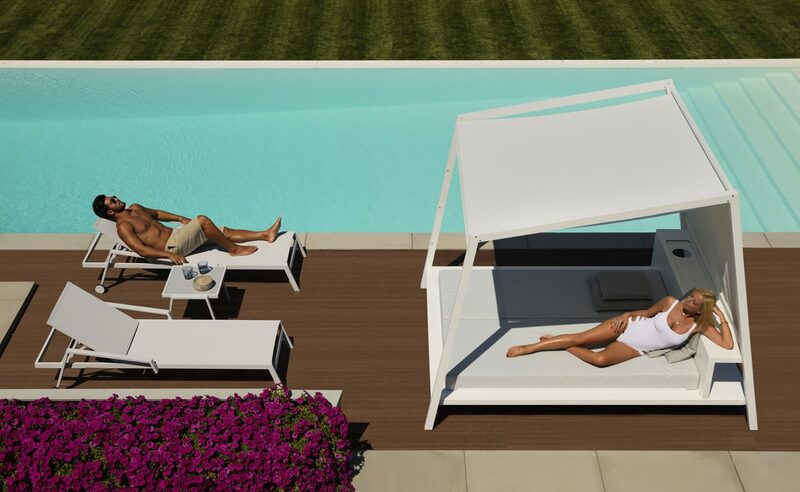 Our team at Brands International believe that choosing outdoor furniture should be given the same purchasing and thought process as much as indoor furniture. The significance of good outdoor furniture cannot be emphasized enough. We need to debunk the common misconception that outdoor furniture should be of an inferior quality than our indoor pieces. 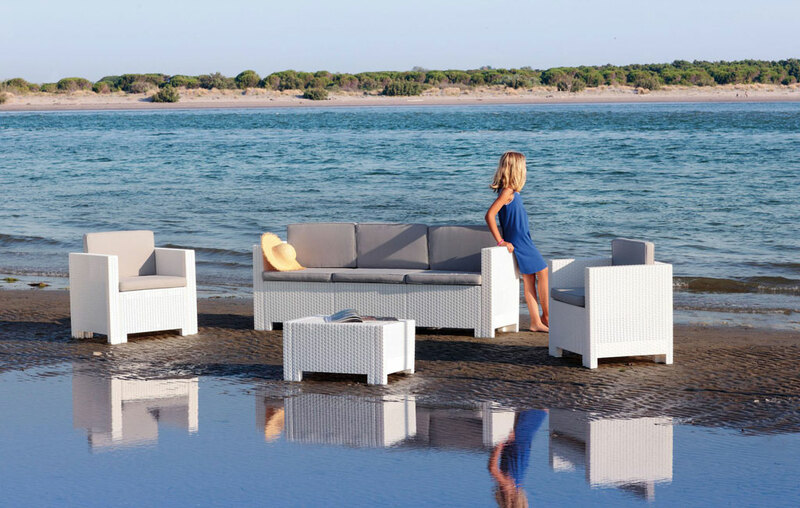 If you’re interested in viewing our wonderful collection of outdoor furnishings for all budgets we invite you to come visit us at our San Gwann showroom.